While TVs have become better and better over the past 15 years, audio has taken several steps backwards. Many of us have sacrificed fidelity in pursuit of convenience and portability, adopting inferior audio codecs such as MP3 and making them our new benchmarks. Lossy formats such as that strip music of its dynamics, detail, and vitality. But it doesn’t have to be that way. Pick up a high-resolution digital audio player (DAP) and you can have your cake and eat it, too. Unlike old-school MP3 players, Apple’s iPod touch, or a smartphone, high-res DAPs are designed with high-end audio circuitry, high-powered digital-to-analog converters (DACs), and amplifiers that can drive a wide range of audiophile-class headphones. Their exclusive purpose is to play music, and while they can play just about any type of music file, they’re really designed for the formats and codecs that deliver better-than-CD quality. 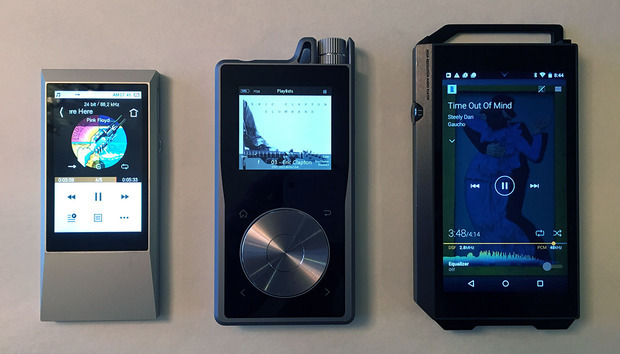 We evaluated three high-res DAPs for this roundup: The Astell&Kern AK Jr ($499), the Pioneer Electronics XDP-100R-K ($699), and the Questyle QP1R ($899). Each unit delivers a very different experience, but with our criteria being the best balance of features, ease-of use, high-resolution codec support, and portability, our top pick is the Android-based Pioneer XDP-100R. Pioneer’s XDP-100R is our top all-around choice for best high-resaudio digital audio player. The Pioneer XDP-100R’s user interface is exceptional. It’s intuitive, slick, and responsive. Navigating and searching for songs, albums, or artists is effortless. The player’s feature set is second to none, as is its codec support, being the only player in this roundup to promise support for Meridian’s MQA high-res music format (albeit via a future firmware update). Our pick for runner-up was a tossup, but we gave the nod to the Astell&Kern AK Jr. This was by far the thinnest, smallest, lightest, and least-expensive DAP of the three. As such, it’s a great choice for music lovers who prioritize portability. In contrast to the competition, the AK Jr has only one MicroSD expansion slot, and its display suffered from significant lag. Though not without its flaws, the Astell&Kern AK Jr was the smallest, lightest, and least-expensive high-res digital audio player in our roundup. The Questyle QP1R is the money-is-no-barrier audiophile’s choice. Its overall superb sound (the best of the bunch), ability to drive a wide-range of headphones, digital Toslink output, and ability to play DSD files natively are just a few of its highlights. Unfortunately, the QP1R’s click wheel and several aspects of its user interface left us underwhelmed. If you can get past those shortcomings, the QP1R—though expensive at $899—is a great choice for the discerning music lover who wants a high-res platform for both on-the-go and critical music listening on a high-end audio system. 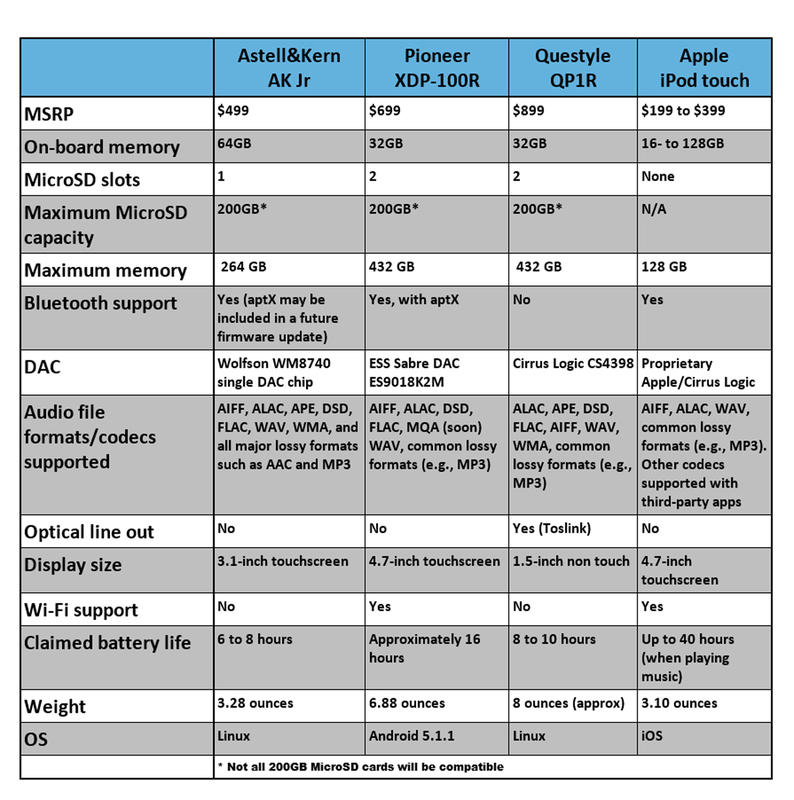 The following table will give you a side-by-side comparison of the players, along with a mainstream media player—Apple’s iPod touch—as a reference point. The feature sets of high-res DAPs can vary considerably (click to enlarge). We tested each player with Bowers & Wilkins’ P7, B&W P5 Wireless, and B&W C5 (Series 2) headphones in a variety of listening environments. Bowers & Wilkins’ P7 was my go-to headphone for all critical listening. We used Bowers & Wilkins’ P7 over-the-ear headphones for our critical listening tests. We copied a collection of high-res ALAC, FLAC, and DSD music files to 64GB microSD cards and used them with all three players. Test files were encoded with 24-bit resolution at sampling rates ranging from 48- to 192kHz. Some of the music files we used were supplied by the manufacturers; others were purchased from HDTracks, B&W’s Society of Sound, AcousticSounds, and similar high-res music-download sites. We also purchased some of the same albums on CD and from the iTunes store (the latter as lossy AAC-encoded files) for comparison. Selecting a high-res DAP can be daunting. They come in all shapes, sizes, and price points. I’ve outlined some feature you should look out for. Along with ALAC, FLAC and DSD are two of the more popular lossless audio codecs you’ll see for high-res music. User interface: Aside from physical characteristics, differences between user interfaces can be dramatic, and they can make or break your overall experience. Some players are based on the Android operating system and will be very familiar to Android smartphone users. Other players have proprietary user interfaces with a touchscreen, a click wheel, or navigation buttons. The player’s user interface can influence what you can and can’t do on the player (such as searches) and how easily you can perform certain tasks (such as creating playlists). High-res DAPs have huge differences in user interfaces. Pioneer’s Android-based UI is our favorite. Font sizes and legibility vary greatly among the different DAPs, and some don’t you to adjust the font sizes. If you have trouble reading small font sizes, then you should consider a model that runs the Android OS, which will provide font-sizing options and other accessibility options. Volume button location: The location and size of the volume controls are surprisingly important. The location of the volume button can determine whether or not you can use a player with one hand. Transferring songs: Copying songs to external MicroSD cards is drag-and-drop simple, but the way a DAP handles copying music files to its internal storage varies from one DAP to the next. Some players, like the Pioneer XDP-100R, will mount on your computer like a hard drive, so you can drag-and-drop copy; others require software on the host computer (and in some cases, that software might be available only for Windows). Check the specs carefully. The Questyle QP1R’s volume control is on its distinctive crown dial. Storage capacity: High-res DAPs have both internal storage and expandable storage via microSD card slots. Because high-res music files are significantly larger than MP3s or iTunes AAC-encoded files, we recommend having a minimum internal storage of 32GB and at least one—preferably two—microSD slots. DAC (digital-to-analog converter): The DAC is one of the most important elements in a digital audio player’s design. This is the hardware that converts a digital signal into an analog signal that you can hear through headphones or loudspeakers connected to an amplifier. Some DAPs can also serve as a high-end USB DAC for your computer, keeping the signal in the digital domain until it emerges from the noisy environment inside your computer. Two specs measure a DAC’s capabilities: Resolution (expressed in bits) and sampling rate (expressed in thousands of cycles per second and notated as kHz). We recommend that you look for players whose DACs support at least 24-bit/192kHz, which will enable it to decode a digital signal encoded with up to 24 bits of resolution at a maximum sampling rate of 192kHz. Note that these specs measure conversion capability, not necessarily the quality of the resulting conversion. Most high-res digital audio players will support microSD cards up to 200GB. Be sure to use high-quality, name-brand cards. Native DSD playback: DSD is the digital audio format used by SACDs. Many high-res DAPs support DSD, but not all do. And not all players handle DSD files in the same way. Most players convert DSD into PCM (Pulse Code Modulation) for playback. Some people object to the notion of converting DSD to PCM. If you share this concern, then look for a player that plays DSD files natively. Whether or not you can hear a difference between the native DSD file or the converted PCM is beyond the scope of this roundup. Bluetooth: Not all high-res players come with Bluetooth. If you plan on using Bluetooth wireless headphones with your digital audio player, we recommend that the player supports aptX, which promises near CD-quality wireless playback. To get the full benefit, however, both the player and the headphones must support aptX. Some high-res players support Bluetooth streaming and others don’t. You’ll get the best Bluetooth experience with equipment that also supports the aptX codec, which delivers near-CD-quality audio. Streaming services: If you want to access streaming services such as Tidal (one of few that stream FLAC), take note: Not all high-res DAPs are equipped with Wi-Fi adapters, and even fewer have integration with streaming services. If streaming services are important to you, be sure to buy a DAP that can connect to Wi-Fi networks. Remote control: Many (if not most) of today’s high-resolution DAPs come with their own analog-style volume controls. Consequently, most DAP’s do not work with in-line headphone remote controls. If this feature is important to you, then check the manufacturer’s specifications carefully. Hi-Res Audio logo: Some DAPs bear the Hi-Res Audio consortium’s logo. A DAP bearing this logo doesn’t necessarily mean that it outperforms one without the logo, it just means that its manufacturer has paid a licensing fee and agreed to follow a set of product guidelines and performance requirements. Some DAPs will bear the Hi-Res Audio logo. This certification indicates that the player meets a set of minimum specifications for playing back high-res music files. What do you need to experience high-res music? John Siau, Vice President of Benchmark Media Systems, wrote an excellent summary of what high-res music is—and is not. It’s a great introduction to the topic. Needless to say, in order to experience the audible benefits of high-resolution music, you need a high-quality component at every stage of the signal path. For the purposes of this discussion, that means music recorded, mastered, and encoded in high-res; a digital audio player—the DAC and amplifier elements—that supports high-res playback; and headphones capable of reproducing high-res music. Your playback will only be as good as the weakest link in your system. Meridian’s newish Master Quality Audio (MQA) format certifies that the musical track was sourced from the original studio-master recording. Headphones: While you might enjoy your Apple earbuds for walking down the street, they won’t deliver the full benefit of high-res music played through a high-res DAP. You’ll want to invest in a high-quality pair of headphones—preferably the over the ear type—which have larger drivers, greater dynamics, and the added benefit of lowering the noise floor as you listen. High-quality headphones can be found for a few hundred dollars, with premium audiophile models easily costing more than $1000. While most music lovers can’t afford Sennheiser’s $1699 HD 800 S headphones, you do want to use the best quality headphones you can afford with a high-res digital audio player. That likely means spending a few hundred dollars. High-res music-download sites: The tracks you’ve ripped from CD are not high resolution, and you won’t find high-res music files at the iTunes, Amazon MP3, or Google Play stores, either store either—at least not yet. Upconverting those music files won’t magically transform them into high-resolution tracks, either—you can’t put in what was never there in the first place. Your best sources for purchasing high-res music files are online stores such as HDTracks.com, B&W Society of Sound, Linn Records, AcousticSounds.com, or iTrax.com. But buyer beware: Some sites classify tracks as high-res even though they were recorded and mastered at only CD quality (16-bit/44.1 kHz). Can you really hear the difference? Now that’s the big question isn’t it? Can you really hear the difference? Read very carefully as many manufacturers will make a claim something to the effect that their high-res music player “reveals more of the original musical performance than an MP3 player or smart mobile phones.” Saying high-res is better than MP3 is no better than saying a CD is better than an MP3 file. Of course it is, and many can't hear the difference between an MP3 file and a CD (or a high-resolution track for that matter). Think you can? Try this online test from NPR.org (be sure to listen on the best-quality headphones or speaker system you have). Think you can tell the difference between MP3 files and uncompressed WAV files? Take this test at NPR.org to find out. Now things get muddier when it comes to the differences between CDs and high-resolution music files (you can download CD-quality and high-res files as part of this experiment conducted by Scott Wilkinson and Dr. Mark Waldrep on AVS Forum to see if you can tell the difference). That’s why you’ll oftentimes see manufacturers (and even high-resolution music sites) compare their stuff to MP3. So what’s the bottom line here? Properly recorded and mastered high-res music is the real deal, but don’t be surprised if you or your friends often can’t tell the difference between CD and high-res tracks. At the risk of oversimplifying the details, just know that “high resolution” is being defined by the audio industry as anything exceeding CD quality. For many, that definition simply isn’t good enough. If that’s you and you want to learn more about some of the issues surrounding high-resolution recording and playback, check out the Real HD-Audio blog by Dr. Mark Waldrep of AIX Records. Happy listening. Could a computer have discovered football legend Ian Wright?